Registrations opened Saturday, July 18, 2015, and this workshop is sold-out. Michael Holter is an artist who may be unfamiliar to many BWS members, but someone worth putting on your radar going forward. 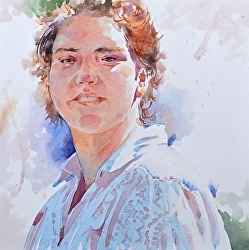 Based in Dallas, Michael is a signature member of the National Watercolor Society, the Society of Watercolor Artists and the Southwestern Watercolor Society. His work has appeared in numerous shows across the country in recent years, where he is winning all kinds of awards. 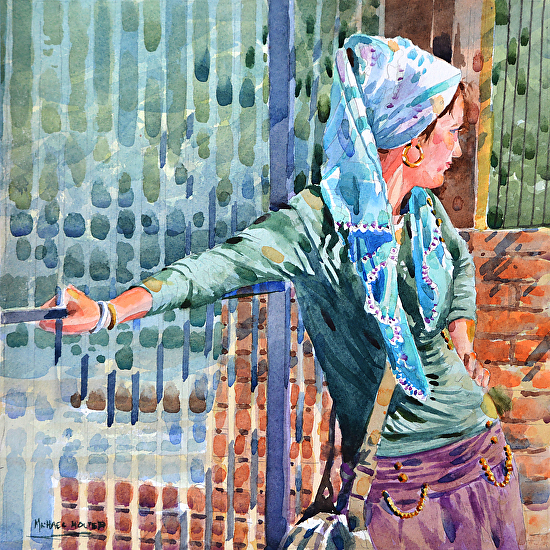 His painting, "Gypsy at the Gate" was published in the most recent edition of Splash. Michael's workshop's are growing in popularity and he now teaches all across the country. This workshop will focus on the use of watercolor to paint exciting impressionistic paintings of people and places. You will explore the use of light and shadow to create interesting compositions and achieve dynamic results. Workshop participants will examine the fundamentals of watercolor painting to assure that all students are familiar with the techniques. Daily discussions and application of the principles and elements of design will be woven into the painting experience. Each day students will engage in exercises that will solidify the content being worked on, and will spend time viewing other artists' work. We will discuss the methods and the impact that these artists achieve using their techniques. Michael will demonstrate his approach to creating portraits and landscapes using live demonstration and several high-speed video presentations. The supply list and set of advance preparation instructions pertaining to the photographs will be provided later on. Check back after September 1. The price for the workshop is $365 for BWS members (Signature Artists and Associates) and $400 for non-BWS members. I am personally excited about bringing Michael Holter to Baltimore for a few different reasons, and I hope that some of the BWS members share my enthusiasm. Most of the artists we bring to Baltimore are more established "names". Michael has more recently transitioned to the status of full-time for-profit artist, and I am anxious to hear about his journey. He paints in a style somewhat reminiscent of Ted Nutall. Like me, he admires Ted's style and has taken multiple workshops from Ted. (I think Ted's teaching "stuck" a little more successfully with Michael than it did me though:) If you wanted to get into Ted's workshop but missed out, or if you want a second dose, this could be a good option. Michael is an excellent teacher, and since his style is still evolving and he is still learning, many of us can benefit from what he has figured out and his thought process about being a student. Just food for thought. Check out Michael's website at http://michaelholter.com for yourself. Paid registrants who cancel before December 15, 2016 will receive a full refund less a $25 cancellation fee if the spot can be filled from the waiting list. If the spot cannot be filled, the amount refundable is 80% of the workshop price. Paid registrants who cancel after December 15, 2016 will receive a full refund less a $50 cancellation fee if the spot can be filled from the waiting list. If the spot cannot be filled, no refund will be given. In the event of inclement weather, the workshop will still be held unless the Hawthorn Center is unable to open or Mr. Holter is unable to travel. If BWS cancels the workshop, then all paid registrants will receive a full pro-rata refund for those days that were cancelled. "Homage to Janet" by Michael Holter. Lauren McCracken selected this painting to receive the "Best of Show" honors at the Lake Granbury Art Association juried exhibition.